Okay, I've been waiting for a long time for a case worth posting in my blog. I ran into this one during a search for much less interesting, standard challenges, for teaching newbies the basics of RE. This one is a bit beyond what you guys are used to, and I really want you to give it a try before you read this. If you crack it quickly then don't bother reading, if you already have 3 letters of the serial and you're stuck you should start reading from phrase F.
I won't teach you how to use a debugger or how to trace the relevant RE chunk of code, there's tons of tutorials that'd do just that. You should consider this as a case study, what's interesting is the case itself and my focus would be accordingly. 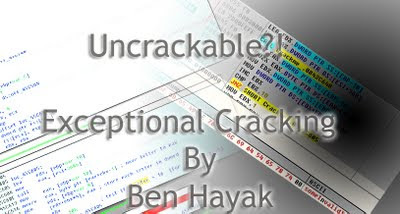 One of the reasons I chose this crackme is because it "forces" u to focus on discovering the serial itself and not just 'patch & trash' waste of time, additionally the serial discovery is special. The goal is to find the serial key. I'll show the entire process including the method I used and why I chose to use that method, and I'll hand over the correct serial.